"Some of the Math Club nerds have got a real live alien! They're hiding it in a basement rec room." High School junior Mark Bamford didn't believe the silly rumor. For one thing, California homes don't have basements. Besides. A stranded alien? Such a cliche. A movie rip-off. Couldn't the math geeks think up a better hoax? Only... was it a hoax? What about all those black vans from the super-secret Cirrocco Corp cruising all over town, as if searching for something? Time to do some investigating of his own. Only, who could he turn to for help? The skateboarding "X" crowd? The varsity climbing team? When it it came right down to it, should he turn to the least likely ally of them all? 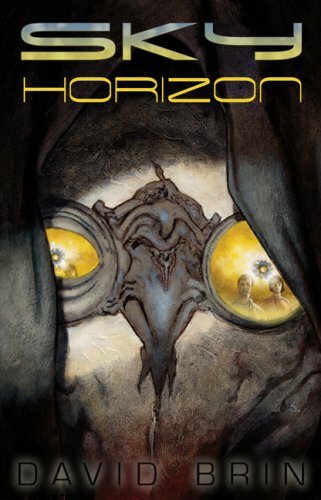 Sky Horizon explores a possibility that has always fascinated, since the days of Homer -- that of strangers from beyond -- and gives it new shape under the deft hand of one of science fiction's modern masters.